The Eight of Swords represents restrictions and entrapment. Opposite, pessimism and doom and gloom will govern. There is a belief you have no options. You are stuck in a situation you can’t get out of. Depression and fear controls your every thought. Isolation and victimization is the feeling of this image. If the Eight of Swords shows in a tarot reading. Your mind is then free to turn even more negative and hopeless. There is a vicious cycle with psychological imbalance and dysfunction. With negative beliefs and attitudes convince you. There is no way out. You are the result of your circumstances. May feel your problems or the walls closing in around you. Many fears are showing up in this moment: fear of not having the skills, failure, success, not liked, judged or criticized, blamed. The list could go on and on and on but what keep you imprisoned are fears and the small chaotic world that is your mind. You need to calm down, lose the hysteria and drama so that you can look at your situation in a more objective manner. Stop being a slave to your problems. Pride may prevent you from seeking help in the right places. 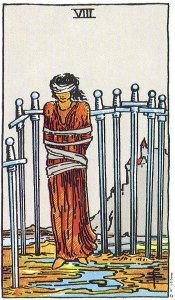 The Eight of Swords can also suggest that you are the victim of persecution. There may be those set against you who are making your life a misery. You could be at the receiving end of insulting comments, criticism and verbal abuse. You might have fallen from grace or lost your reputation. Your business may be in extreme difficulty and you feel at a loss as to what to do next. You are at present so stressed out that you just can’t think straight. The pressures of work could become overwhelming and physical or nervous breakdowns may result. You could feel overwhelmed because of building debts and pressures. You could feel trapped in a profession. It was forced upon you or expected of you because of family tradition. If you have been involved in any shady or dubious business you may now be facing the consequences of your actions. The Eight of Swords can show a controlling, violent and abusive relationship. Feeling trapped and terrified, you may not be able to find the strength or courage to get out. Your partner’s threats may live you powerless and isolated. Your self-esteem, self-belief and self-confidence have been smashed. You must find the strength to leave. But, you need to make the first contact with them. You can no longer live like this. In a psychic tarot reading interpretation the Eight of Swords can also suggest a partner who is suffering from severe depression.